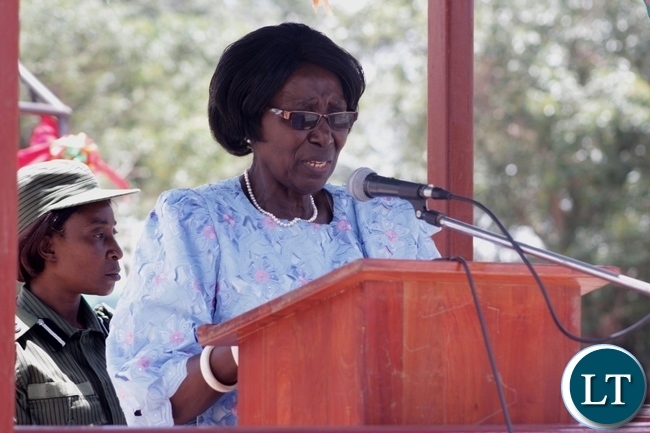 Vice President, Inonge Wina says government expects the church to take a leading role in the promotion of unity. Mrs. Wina says the church should encourage politicians to co-exist and engage in open and positive dialogue. The Vice President says the church has a responsibility to guide the Nation in times such as now when the country is faced with many issues. She says government has faith in the church because it has always offered guidance whenever the country was at crossroads. The Vice President said this today at Cabinet Office, before a closed-door meeting with the church and religious leaders from different faiths. Mrs. Wina hosted the clergy to discuss ways on how the church can best execute their guidance role in the country. The Vice President is expected to issue a joint communique with representatives of the Church on the resolutions from the closed-door meeting, which lasted for slightly over an hour. The meeting was attended by the Zambia Conference of Catholic Bishops -ZCCB- and the Evangelical Fellowship of Zambia -EFZ- among others. She is the same woman who acted as a go between, EL and G.Scott and she played scott, The old ready is evil. That means the IMF & World Bank have refused to jump to Lungu’s aid for kaloba. You are lucky that you had a bamper harvest that will last you another 6 months then after that it’s bottoms up and manga belt because of no matako due to hunger!!! The PF hostage Inonge is missed by NGOs. Lies and manipulation, I wouldnt trust people who love a dictator. Why is it that women in PF and government seem to have better heads on their shoulder’s than men? First Lady Esther Lungu and VP Inonge Wina think more like leader’s than all the men. Even among the Cabinet Ministers, female Ministers are the ones working harder than the men. Dora, Minister of Gender, Nkandu Luo, Mwanakatwe you can see them working. Some male Cabinet Ministers are no where to be heard. I don’t fully agree with you but only to some extent! Yes some women politicians seem to be performing better than their male a.rsewhores like Bweeman Lusambo, Chimpyongo, et al but you still have complete ar.sewhores like Mumbi Phiri. Worse still, women in Govt are a total disgrace – absolutely useless and pure id.iots! Look at Mambilima and judges like Anne Mwewa; Mungeni Mulenga, etal all of them totally discredited. I dont even know why we still have courts when there is no justice. And at ECZ there is or there was Priscilla Mulenga – what a useless and arrogant who.re who brought all these problems to our country!! @Lombe(MA): WHAT ABOUT YOU? WHAT ARE YOU DOING. FIRST YOU HAVE HIDDEN YOUR NAME. SECOND YOU ARE BUSY WRITING INSULTS HERE. WHAT DO YOU DO BEFORE YOU POINT AT OTHERS? OTHERS ARE WORKING FOR YOU. WHILE YOU SIT DOWN EATING (JOHN SO LYE UBWALI). YOU ARE IDLE WASTING ALL YOU TIME BLOGGING NONSENSE WHILE OTHERS ARE WORKING. HOW WILL ZAMBIA DEVELOP WITH CHARACTERS LIKE YOU? lombe where do you see them working in your house? there is a difference between working and idling what you are referring to is idling look armyworms issue is an example the aemyworm butterfly is busy laying eggs and will hatch in rain season look at how they shoot in the dark the army worms have now moved from chisamba to the copperbelt and two days after they have reached eastern province. how long does a bus take from here kitwe to chisamba? so now tell me where they are working. apart from stealing your money. the likes of mumbi phiri? no no! dear. Was Telesphore Mpundu the high profile UPND cadre masquerading as priest also in attendance? Look at these mother fcking PF Chimps! Less than a week ago, their chief ar.rsewhore leader was telling the country that he had NO time for Church Leaders. BUT out of fear and panic, the drunkard has managed to arrange time for his titular VP to meet them. This is proof that he got Telesphore Mpundu’s message although he was playing to gallery at the time! That unhygienic and forever beer smelling PF President is confused and scared at the moment and knows that no one trusts and likes him any more except the PF Kaponyas who have nothing to lose in a lawless society of Pangas! Religion is nothing more than a fraud, emotionally, and often financially. Religion has caused so many deaths through human history, and for what? to see who has the best imaginary friend!!! Try explaining god loves you, and it’s gods will, when someone you care about just got diagnosed with an incurable disease, or murdered. I cannot believe that for how advanced human thinking is, that we even consider that a god even exists, it’s ridiculous. The sooner all the human race come to their senses and see religion for what it is, a crock of s h i t, the sooner the suffering and killing can stop.. So what you are saying is that YOU are an over-developed monkey? Lazy Lungu first wants to find out their angle and if they can be bribed hence sending the useless old Grandma accompanied by his spies….why hold closed door meetings what have you got to hide? Separation of church and state, that’s what is needed. Societies act which churches and ngos are registered under are precluded by law from being involved in politics. @4 Chitutuma, I have the same question was the UPNDonkey Telesbore Mpundu masquerading as a bishop also in attendance? Please mr chilyata, no one pays attention to you so the question is not to you. Chitutuma, most unlikely that the disgraced telesbore donkey was in attendance. He is an export and survivor from Rwanda genocide if you look at his mouth. I hear catholics stopped attending mass at Child Jesus and have gone to pack other catholic congregations instead. Tells you somethinf. Terrible you are an absolute genius.. you can look at a mans mouth and tell his nationality.. a truly remarkable talent. WHICH CLERGY MEN BA BANDA EVERY DAY EVERY YEAR EVERY WEEK EVERY MONTH EVERY REGIME IN STATE HOUSE LIKE MEN OF ALL SEASONS LOOKING FOR BROWN ENVELOPES THESE PEOPLE ARE CADRES BUT THE CHURCH HAS MANY PEOPLE WITH INDEPENDENT BELIEFS AND IDEOLOGIES I WONDER THEIR FOLLOWERS. WHY THEY JUST BASED IN TOWNS WE WANT THEM TO PREACH EVEN IN VILLAGES. IS IT BECAUSE VILLAGERS HAVE NO MONEY TO GIVE THEM? TOO BAD. BECAUSE THEM TOO NEED YOUR PREACHING. THANKS CATHOLICS. Church mother bodies being counseled by Inonge, a double standard woman. That’s what happens if the clergy are too interested in money than God. Even Satan can give you direction. Jay Jay you wanted them to invite you? Sorry you are a nobody to attend such kind of meetings, just stick LT.
@14 Masalamuso, you mean to tell me that you cannot tell or see that you are a UPNDonkey yourself?